Nathaniel Jones, a middle-aged businessman from England, travels to the Caribbean island of Anguilla to spend a fortnight on holiday when he’s captivated by a brilliant and beautiful member of the local community, Sheila Rawlingson. After a secret, intense hundred-day courtship, Nathaniel proposes to Sheila, whose agreement to marry this white man is seen as a betrayal by her family and fellow Anguillans. Recognizing the value Anguillan society places on economic projects, Nathaniel attempts to set up an airline business to gain the support and favor of the Rawlingsons. Nathaniel sends for his son, Dragon Jones, to travel to Anguilla and cofound Dragon Wings, the nation’s first commercial airline. Nathaniel, Dragon, and Sheila turn to her uncle for financial backing. Sheila’s uncle, however, foils Nathaniel’s best-laid plans at every turn. 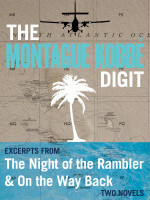 Kobbé’s hilarious social novel brilliantly echoes A Confederacy of Dunces and Herman Wouk’s Don’t Stop the Carnival.